Membership in the Prospect Bay Tennis Association is open throughout the year; dues are $15 per person or $25 per family, and are payable upon receipt of invoice. Courts may be reserved at the Golf Shop seven days in advance as long as the reservations do not conflict with scheduled events or activities. Court reservations are limited to one hour for singles play and one and a half hours for doubles play. Sanctioned matches such as ladder play, tournaments, and team play may be completed even if they run over the designated time period. Reservations expire ten minutes after the scheduled starting time. If the member holding the reservation has not appeared, the time slot will be considered for waiting players. Reservations must be honored, and every effort must be made to cancel a reservation that cannot be met. Proper attire, including tennis shoes, must be worn on the courts. Swimwear, cutoffs, and blue jeans are not appropriate attire. Men must wear shirts with sleeves. Juniors under age twelve are not allowed on the courts unsupervised unless certified by the tennis pro. Roller-blades, skateboards, bikes, baseball, etc. are not allowed on the courts. 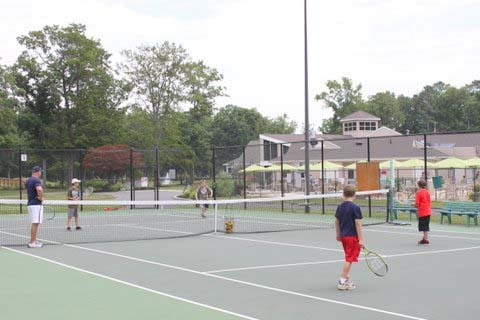 The tennis courts are designed for tennis play only. No other activities will be allowed. The backboard may not be used while play is in progress on any court. Any violation of the above tennis rules may result in the loss of privileges. Members may bring guests for a fee, which will be published in The Beacon.